HÀ NỘI — African swine fever outbreaks have been successfully contained in Hà Nội and Hưng Yên and Hải Dương provinces, according to a senior official. The outbreaks were in Ngọc Thụy Ward in Hà Nội’s Long Biên District, Đức Hợp Commune in Hưng Yên’s Kim Động District and Đại Đồng Commune in Hải Dương Province’s Tú Kỳ District. Phùng Đức Tiến, Deputy Minister of Agriculture and Rural Development, said at a press conference held in Hà Nội on Friday that several outbreaks in Hòa Bình Province would be taken care of soon. A place is considered free of the disease after 30 days without new infection, he said. The first case of African swine fever in Hà Nội was reported in Long Biên District’s Ngọc Thụy Ward on February 24. About 25 infected pigs were culled. 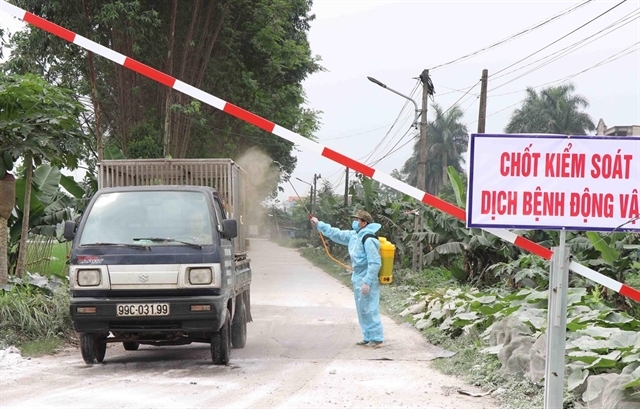 After the outbreak was detected, the People’s Committee of Hà Nội requested district authorities work with related agencies to prevent it from spreading. As a result, the outbreak has been controlled and the district was declared free of the disease on March 28. Similarly, the other provinces, Hưng Yên and Hải Dương, also announced they were free of the disease on March 29 and April 4, respectively. Đàm Xuân Thành, deputy head of the Animal Health Department under the Ministry of Agriculture and Rural Development, said the end of the epidemic would enable people to transport pigs elsewhere for consumption and to purchase young pigs. Tiến urged breeders to apply secure breading to protect their pigs from diseases as there is no vaccine available for the disease. The deputy minister proposed that large livestock breeding enterprises enhance security measures, especially for sows with the purpose of securing enough young pigs for breeders after epidemic ends.